HP has had its eyes on the lucrative A3 copier market for many years without ever achieving the breakthrough that its size and position in the print industry warrant. Now, with the acquisition of Samsung Printing Business (including more than 6,500 printing technology patents), the launch of a new range of Laserjet and PageWide A3 and A4 MFPs and the establishment of an experienced partner network, its ambitions might finally be realised. A 20% share of the A3 market by 2020 is nothing if not ambitious, but HP is clearly in a much better position to achieve this goal today than it was in the days of Edgeline technology and, before that, the Mopier. There are many reasons why this is so, from the strength of HP’s offering in both laser and inkjet printing to the quality of the dealer network it has assembled. In the UK and Ireland, HP has taken on approximately 25 partners to sell its A3 products, ten of whom are new to HP. One such is Vision, which has been awarded the highest level of HP Partner Accreditation. Vision, a fast growing provider of managed print and document services, has been managing customers’ print requirements since 1985, providing solutions from Canon, Ricoh and Samsung and servicing them through a nationwide network of field-based service engineers and network specialists. The company’s success in the MPS market – it was recently included in a list of Europe’s 1,000 fastest growing companies compiled from 2012-2015 data by the Financial Times and Statista – and its position as a Samsung Global Partner are an obvious attraction to HP as it seeks to make its mark in the A3 MFP market. Neil Sawyer, HP’s UK & Ireland Channel Director, is clearly excited to have a company with Vision’s experience as a partner. 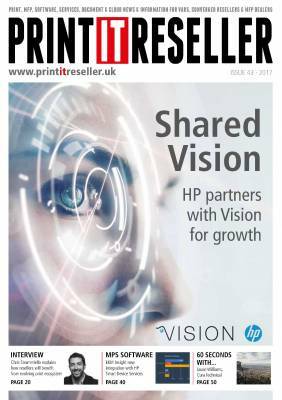 Vision is just as enthusiastic about the relationship, recognising in HP a partner with the drive and product range to support its own appetite for growth. Strong as the Samsung brand is, Operations Director Mark Smyth sees the HP name as a key attraction that will open up new opportunities for Vision. “HP is an established and recognised brand that’s highly respected in the business-to-business and corporate space. There’s an old adage that no IT Manager ever got fired for buying HP and we believe that this will help us to make further inroads into the corporate market”. As a Samsung Global Partner, one of just a handful worldwide, Vision is already familiar with the strengths of the Samsung print engine on which HP’s range is built and for which HP now has the IP, R&D and manufacturing facilities. As well as continuing to support its installed base of Samsung devices, Vision will henceforth be selling and supporting HP’s new range of A4 and A3 MFPs, in addition to its existing offering from Canon, Ricoh and, for a transitional period, Samsung. Available to HP managed print services providers, HP’s range includes 13 A3 Laserjet toner devices and three A3 PageWide MFPs with print speeds of up to 80 pages per minute in general office mode. In total, there are 54 SKUs, giving qualified channel partners the ability to offer higher levels of customisation, industry-leading security and longer device uptime via HP’s cloud-based Smart Device Services (SDS) technology, which adds advanced diagnostics, device-specific troubleshooting and remote remediation capabilities to the MPS tool sets used by HP resellers. When HP announced its new A3 devices it promised to shake up the existing $55 billion copier market and transform business printing by delivering devices that were simpler, more reliable and easier and cheaper to service than competitor models. Smyth is impressed with this aspect of HP’s new toner devices but says it is too early to determine exactly what effect they will have on resellers’ cost base and, therefore, prices for customers. “HP is using a Samsung engine to make a device with low running costs and easy servicing, which is a key feature and desirable for all resellers. HP has said that they are more cost-effective than existing A3 MFPs, but given the current market competitiveness, it is difficult to gauge how much more affordable an HP Laserjet MFP might be for customers over the course of an MPS contract, compared to a model from another provider,” he said. Smyth is more forthright about the cost benefits of HP PageWide devices, which Vision will also be taking on. The game-changing inkjet technology, which combines a page-wide printhead, fast-drying inks and a flat paper path, offers a high speed, economical alternative to laser MFPs for organisations that value low running costs more highly than print quality. “PageWide is a cost-efficient, high performance technology. It is not necessarily the highest quality output device – it’s not aimed at the high quality print market, but at organisations that need entry-level colour print quality at high speed. It is very cost-effective and that gives us the potential to reach new customers,” he explained. Smyth expects a great deal of interest from Government and public sector organisations, a market that Vision knows well thanks to its position on three purchasing frameworks – the National Education Printer Agreement (NEPA); Crown Commercial Service (CCS), incorporating Yorkshire Purchasing Organisation (YPO) and Eastern Shires Purchasing Organisation (ESPO); and the Crescent Purchasing Consortium (CPC). “Because of their responsibilities, public sector bodies are very cost-conscious. Running costs for them are much more significant than print quality, which makes PageWide a very interesting proposition for that market,” he said. Another aspect of HP MFPs that Smyth expects to resonate with Government buyers is their world class security. With GDPR regulations coming into force in less than a year, this should also be a major consideration for commercial organisations. Embedded security features on HP’s devices include: HP Sure Start BIOS, which validates the integrity of the BIOS at every boot cycle and, if a compromised version is discovered, restarts the device using a safe ‘golden copy’ of the BIOS; whitelisting to ensure that only authentic, good HP code is loaded into memory; and run-time intrusion detection, which helps protect devices while they are operational and connected to the network by checking for anomalies during firmware and memory operations and by rebooting in the event of an intrusion. Other security features include built-in encryption to protect data stored on the hard drive, secure erase to remove sensitive information from the device and the ability to disable ports and protocols to prevent unauthorised access. Vision is currently three years into a five-year plan to double in size by 2020. It hopes to achieve this goal by continuing to develop its core business of managed print and document services, whilst also focusing on production printing, IT services, client retention and service excellence. The latter is a fast growing part of Vision’s business that offers considerable scope for an even deeper relationship with HP. In a recent interview with PrintIT Reseller, Neil Sawyer pointed out that one of the benefits HP resellers enjoy is HP’s commitment to growing both its core business – transactional and managed print – and new areas of operations, such as 3D print. “Our future strategy with partners is looking beyond what the market demands today to what we know they’ll be demanding in the future. A good example would be the investment we’ve been putting into 3D printing; we genuinely believe that is a game-changer for the future. Whether with our core or our future strategy, HP has got a very sustainable partnership with our resellers. We don’t stand still and we always help them grow in areas that perhaps they hadn’t explored in the past,” he said. With ambitious growth targets of its own, Vision appears to have found the perfect partner in HP. A shared vision for growth and a shared appetite for success, makes theirs a relationship with huge potential.